There’s an assumption in data citation that all the datasets in a repository are fixed and final, just as a research paper when published is in it’s fixed and final form. In practice this isn’t quite true, there’s a lot of use case where the data in a datastore is subject to change – the obvious cases being longitudinal or observational studies, which these days can be extended to cover datasets derived from automated sensors, with consequent errors due to technical failures, and subsequent fixups. Most researchers actually only work on an extract of the data, and current best practice is to redeposit the extract along with a description of how it was created as if it was a new dataset. This is fine for small datasets, but does not scale well for big data, be it numerical, sensor based, or evenworse multimedia – video recordings of language and accompanying transcripts being one use case. I have previously thought about using bazaar, subversion or git as a version control system, creating a new object each time the dataset updates, but that also suffers from scaling problems, but at least ahs the benefit of being able to recreate the extract against the dataset at a known point in time. Consequently I was interested to hear Andreas Rauber of the University of Vienna speak on the Research Alliance approach to dynamic dataset citation [PDF of my webinar notes]. Essentially their approach is to use standard journaling techniques to track changes to the data base and to store timestamped queries to allow a query to be rerun against a dataset in a known state to recreate the extract. This approach is highly scalable as regards storage and allows the flexibility of rerunning queries against the datset as was at prior point in time or against the current dataset. As a solution it seems quite elegant, my only worry would be the computational power required to handle and rerun changes where the dataset has been very cahtty with many updates as would be the case with some automated sensor derived datasets. Over the past few months there’s been a growing interest in archiving software projects, such as can be done via Zenodo. This is part of more general problem – as researchers increasing use environments such as iPython notebooks for their resercah there’s a growing need to archive these notebooks to allow a replay of the determination of the results. Inspired by Stuart Lewis’s recent post on a GitHub to repository deposit we’ve recently added a mechanism to the Data Commons to allow the import of metadata from GitHub to the Data Commons, allowing the creation of an object record for a GitHub project. Rather than import the code, we create a referential entry for the project, although of course files could be downloaded and added manually if a local copy was required. The documentation page, covering both technical and user documentation for the ANU Data Commons has been updated. The documentation is covered by a Creative Commons Attribution-NonCommercial-ShareAlike 3.0 Australia License and the source code by a GPL3 licence. One of the advantages of the online revolution is that it makes it comparatively easy to follow presentations elsewhere, in this case an ACM presentation on the development of MOOCs by Andrew Ng, one of the founders of Coursera. I won’t summarise the whole presentation – there’s a copy online, I don’t know if you have to be an ACM member to view it, but I’m sure it would be possible to negotiate access. Yesterday, ANDS hosted a webinar by Max Wilkinson, head of research data services at UCL – clicking on the link will take you to a pdf of my notes. there’s an understanding that there’s a definite problem with data stored on legacy media but it’s a separate problem from managing born digital data . As always, my notes, my views, no one else. As part of our work to develop a solution to better manage metadata about researchers, publications and data, we set off down the road of trying to link publications to datasets, and by extension grey literature, deposited in various online collections as well as linking to information on grants held to try and build a picture of research activity. This is useful in a lot of ways – for example it potentially allows us to implement a service to automatically generate online profile or portfolio pages and highlight a researcher’s most cited papers, or who has had the most international collaborations, and so on. One problem that we immediately hit was that of disambiguation – being able to accurately identify that the Fred Smith who deposited a set of photographs of Wari shroud wrappings was the same person as the Fredrick L Smith who published a monograph on the iconography of early Wari shroud wrappings. Internally this is not really a problem as we have a universal identifier scheme in place, but it does tend to break down when tracking collaborators at other institutions. One could imagine a scenario where colleagues elsewhere publish an analysis of data held in our data repository, and vice versa. This is particularly a problem where you have a number of large scale international collaborations. Granting external people temporary identifiers is not a viable long term answer as people change institution, change their name, change their email address, meaning that over time the information held may become invalid. The obvious answer would be to use some form of persistent universal global identifier, and one in which either the owner of the identifier, or the provider of the identifier, is invested in keeping up to date. In fact there are already a number of global identifiers in use, many of which are proprietary. Examples of possible global identifiers include scopus identifiers, ResearcherID, NLA/Trove identifiers, Google Scholar profiles and the like. However, none of these identifiers are truly universal, as not everyone has the same set of identifiers, and some people, such as early career researchers, may have none at all. Our approach was to build a light weight database keyed to the institutional identifier to record these attributes for each researcher. At the same time ORCID was clearly an identifier gaining widespread adoption worldwide and not tied to any field of study, or scholarly information service, making it suitable for use as a universal career lifetime persistent identifier. As part of feasibility testing we decided to develop an ORCID minting tool, to demonstrate that we could programatically take the information we already knew about a researcher and either create an ORCID id for them from existing data sources or update their existing ORCID record. 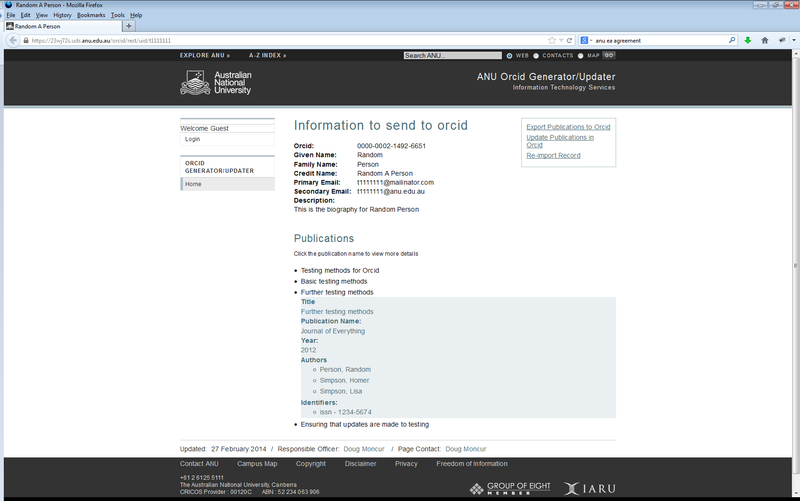 The solution has been tested against the ORCID sandbox. This is very much a proof of concept exercise but we believe that the code is sufficiently robust a that it could form the basis of a generic ORCID client. under a GPL 3 license. As it is prototype code no warranty is made to its suitability or fitness.